A sociable older person is seeking a Sharer for their home to give them some friendly company and around 10 hours a week of practical help in exchange for the low-cost accommodation. This person would really benefit from cheerful company, especially in the evenings. This person has memory loss, and receives plenty of support during the day. 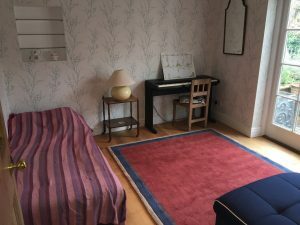 The accommodation on offer is a double bedroom in a family house with on-street parking and a garden. There is a bathroom that will be for the sole use of the Sharer unless guests are staying. The kitchen has a washing machine/dryer, dishwasher and microwave. The accommodation is situated in the village of Brill which is a 20-minute bus ride from Aylesbury. Bicester and Thame are the nearest towns and the nearest BR station is at Haddenham. This older person would appreciate some practical help, which could include light cleaning and tidying, some shopping, cooking, taking out bins and changing lightbulbs, for example – but mostly is looking forward to the companionship of having someone living with them, sharing an evening meal, reminding them to take their medication and helping them to get out and about. This older person loves classical music and plays the violin, so someone who shares this interest would be an ideal Sharer. They must also be a non-smoker who speaks clear fluent English. We are looking for someone who is cheerful, organized and supportive. If you are interested, please email a little information about yourself, your hours of availability, if you can commit for at least a year, and why you are interested and think you may be suited to this share. We can then give you more details about this specificsituation. £125.00 + 20% VAT per month [Total £150.00 per month] plus possible contribution to council tax of approx. £25 per month.